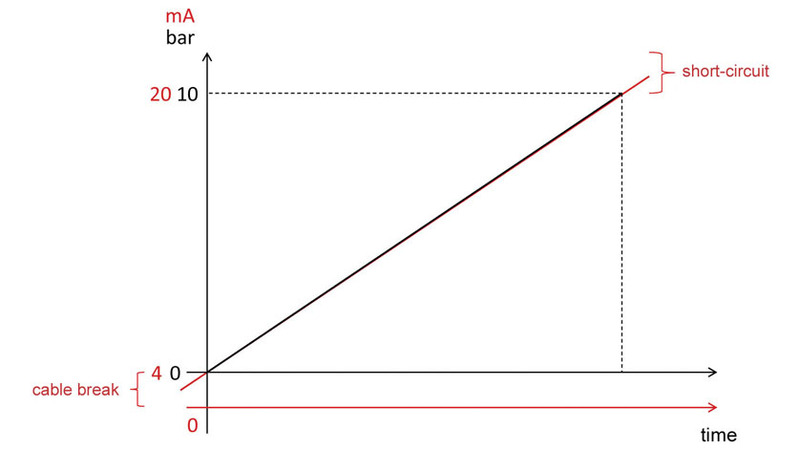 In industrial automation and in pressure sensors in particular, the current signal of 4 … 20 mA is the most frequently used signal for analogue transmission of values. The wide use of this signal is due to its ease of handling and especially its interference resistance. A current signal has a higher EMC interference immunity than a voltage signal, due to the fact that electromagnetic interferences are fed into the signal line as voltage signals and result in only very small changes in current at input resistance of the receiver. Very widely used is the 4 … 20 mA signal in the transmission of values such as temperature and pressure. For example, the 0 … 10 bar pressure range of a pressure transmitter in a production process is converted by the electronics in the device into a 4..20 mA current signal. As two-wire signal, 4 … 20 mA has in the meantime been given preference over the three-wire version, due to its savings in wiring and its easier error detection. In this version, a cable break is detected by the current value falling below 3.8 mA and a short circuit of the sensor, e.g. due to an electronic defect, by the current value exceeding 20.5 mA (according to NAMUR NE43). 4 … 20 mA in the three-conductor version is still being used, but only for devices with high supply power requirements.